Election Day is just over two weeks away and local election officials say they have been busy. Lindsey Light, Supervisor of Elections for the Vermilion County Clerk’s Office, says Early Voting ‘’has been pretty crazy.’’ She says that office has been handling 50 to 60 walk-in voters a day who want to vote early. ‘’And the number of requests to vote by mail has set a new record,’’ added Light. 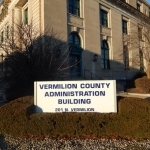 Light says 587 total ballots were mailed out by the Vermilion County Clerk’s Office in the last Gubernatorial Election. So far this year more than 700 ballots have been mailed. And Light says many voters are saying they do not want to sit out this election. Sandy Delhaye, Executive Director of the Danville Board of Election Commission, says Early Voting in that office has also been heavy. In addition to the governor’s race, Delhaye says the proposal to change Danville’s form of government seems to be convincing many voters to vote early. Both offices will be open during regular hours today (Friday, October 19th, 2018) and will also be open on Saturday from 9:00 a.m. until noon.